CARFAX Certified 1 Owner - No Accidents - Fully Serviced - QUALITY CERTIFIED up to 10 YEARS 100,000 MILE WARRANTY This Mercedes-Benz includes: NAVIGATION SMARTPHONE INTEGRATION Smart Device Integration HEATED FRONT SEATS PANORAMA SUNROOF PREMIUM 1 PACKAGE SPORT PACKAGE HARMAN/KARDON SOUND SYSTEM *Note - For third party subscriptions or services, please contact the dealer for more information. 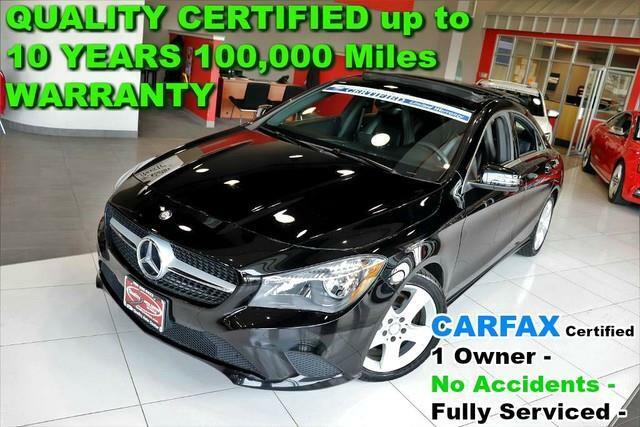 * This Mercedes-Benz CLA has been loved by its original owner as CARFAX shows it to be a one-owner. This wonderfully fuel-efficient vehicle offers a supple ride, quick acceleration and superior styling without sacrificing MPGs. This Mercedes-Benz CLA is equipped with AWD for improved handling. Whether you're faced with inclement weather or just out enjoying the twisting back road, you'll have the grip of AWD on your side. It's not often you find just the vehicle you are looking for AND with low mileage. This is your chance to take home a gently used and barely driven Mercedes-Benz CLA. Previous service records are included, making this Mercedes-Benz CLA extra special. If you are looking for a pre-owned vehicle that looks brand-new, look no further than this Night Black Mercedes-Benz CLA. This Mercedes-Benz CLA is well-equipped, well-cared for and still covered under the manufacture's factory warranty. This wonderfully appointed vehicle comes equipped with the options and features every driver craves. Find the quickest driving route in this Mercedes-Benz CLA CLA 250 using the installed navigation system. This nav system is one of the easiest to use and will help get you where you need to go quickly! This Mercedes-Benz CLA CLA 250 has a flawless finish that complements its wonderful interior. A perfect find to complement any rare automotive collection. This beautiful lass will turn heads everywhere she goes. More information about the 2016 Mercedes-Benz CLA: The Mercedes-Benz CLA is the German automaker's attempt to compete with the likes of the diminutive Audi A3 and the BMW 1-series. As the price of gasoline continues to rise, compact luxury cars get more and more popular. Buyers will continue to want all of the technology and luxury features of larger cars without the size or fuel consumption. Mercedes-Benz hopes that attractive styling, a low base price, an upscale name and lots of luxury know-how will be enough to convince buyers to take a serious look at the CLA. This model sets itself apart with Efficient usage of space, beautiful styling, economical pricing, good performance, optional all-wheel drive No Credit / Bad Credit / No Paystubs, No problem !! ! All Approved ! Everyone drives ! CLEAN, GORGEOUS, LOW MILES, SHOWROOM CONDITION. CALL NOW QUALITY CERTIFIED up to 10 YEARS 100,000 MILE WARRANTY , To Certify a vehicle, there will be an additional cost for Certification. CALL NOW For details. STUNNING AGGRESSIVE LOOK ON THIS BEAUTIFUL--Call today to schedule a test drive... Good Credit/Bad Credit/No problem!!!! Get paid cash? No problem!! 100% Credit Approval with interest rates starting at 2.49% for qualified customers, our rates will not be beaten. We price our cars at wholesale price to guarantee the best deals for our customers. Our inventory moves quick, please call to confirm the availability of the vehicle of your interest Springfield location 973-564-0112. This vehicle is located at our SPRINGFIELD location. Come visit our new showroom in Springfield NJ. Thank you for visiting another one of Quality Auto Center's online listings! Please continue for more information on this 2016 Mercedes-Benz CLA CLA 250 with 44,522mi. You could spend more on fuel each month than on your vehicle payments, so why not consider one with exceptional fuel economy like this 2016 Mercedes-Benz CLA. Enjoy safety and stability with this all-wheel drive vehicle and drive with confidence in any condition. This 2016 Mercedes-Benz CLA has such low mileage it has been parked more than driven. More information about the 2016 Mercedes-Benz CLA: The Mercedes-Benz CLA is the German automaker's attempt to compete with the likes of the diminutive Audi A3 and the BMW 1-series. As the price of gasoline continues to rise, compact luxury cars get more and more popular. Buyers will continue to want all of the technology and luxury features of larger cars without the size or fuel consumption. Mercedes-Benz hopes that attractive styling, a low base price, an upscale name and lots of luxury know-how will be enough to convince buyers to take a serious look at the CLA. Interesting features of this model are Efficient usage of space, beautiful styling, economical pricing, good performance, optional all-wheel drive No Credit / Bad Credit / No Paystubs, No problem !! ! All Approved ! Everyone drives ! CLEAN, GORGEOUS, LOW MILES, SHOWROOM CONDITION. CALL NOW QUALITY CERTIFIED up to 10 YEARS 100,000 MILE WARRANTY , To Certify a vehicle, there will be an additional cost for Certification. CALL NOW For details. STUNNING AGGRESSIVE LOOK ON THIS BEAUTIFUL--Call today to schedule a test drive... Good Credit/Bad Credit/No problem!!!! Get paid cash? No problem!! 100% Credit Approval with interest rates starting at 2.49% for qualified customers, our rates will not be beaten. We price our cars at wholesale price to guarantee the best deals for our customers. Our inventory moves quick, please call to confirm the availability of the vehicle of your interest Springfield location 973-564-0112. This vehicle is located at our SPRINGFIELD location. Come visit our new showroom in Springfield NJ.